Department of Botany & Zoology, Stellenbosch University, Stellenbosch, South Africa. to soils that had received no nutrient pre-treatment. [5,6] and soil respiration [7,8]. to full moisture holding capacity . made on excised, stored and homogenised soil samples. them, can successfully predict soil respiration rate. butes) are described in . ration rate was measured every day on each cleared area. 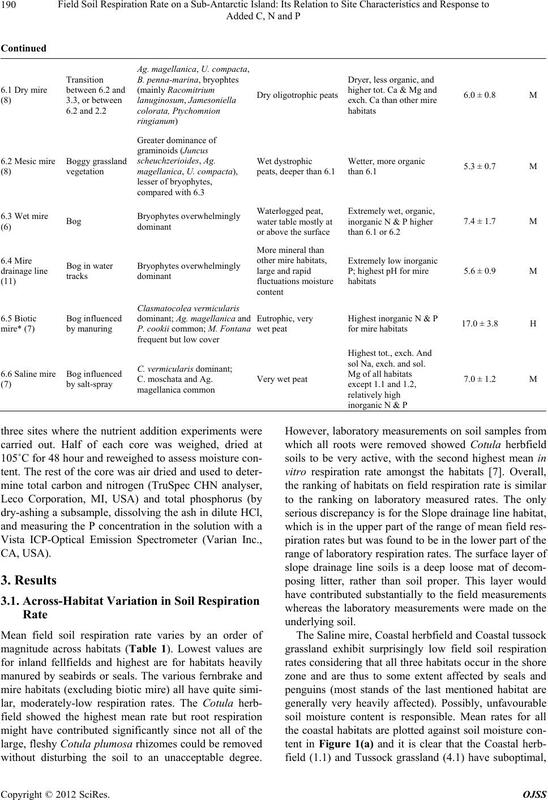 and the number in brackets shows at how many examples of the particular habitat respiration measurements were taken. concentration; sol. 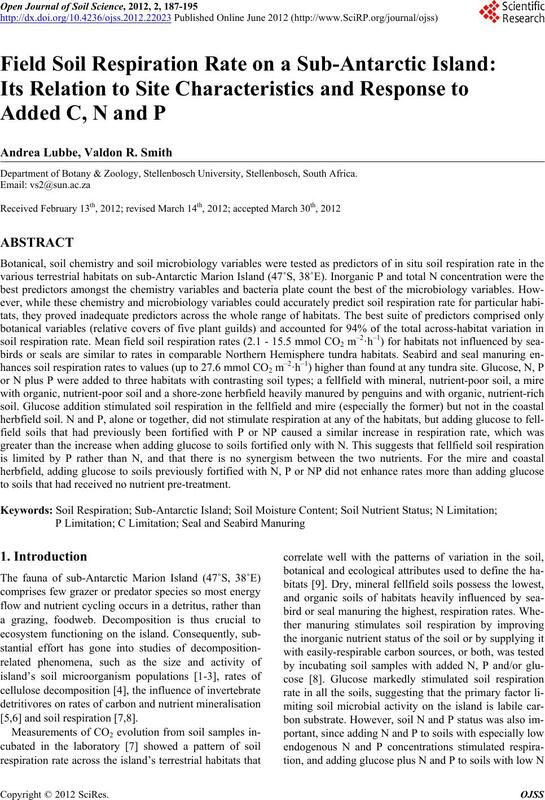 (cation) = soil solution concentration. Very high tot. Na, exch. frequent but low cover C.
sol Na, exch. and sol. without disturbing the soil to an unacceptable degree. and (b) inland habitats. 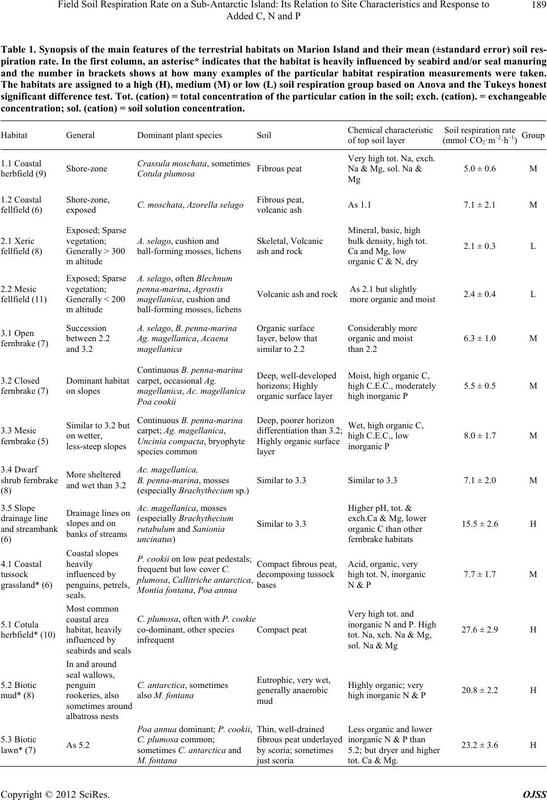 Habitat numbers are as in Table 1. Mean soil moisture contents are from . then decline quite rapidy at higher moisture levels. did not strengthen the predictive ability of the model. higher C, N and P concentrations than the other two soils. fellfield or Co tul a herbfield soils. significantly (P ≤ 0.05) different from each other (Anova and Tukey’s honest significant difference test). 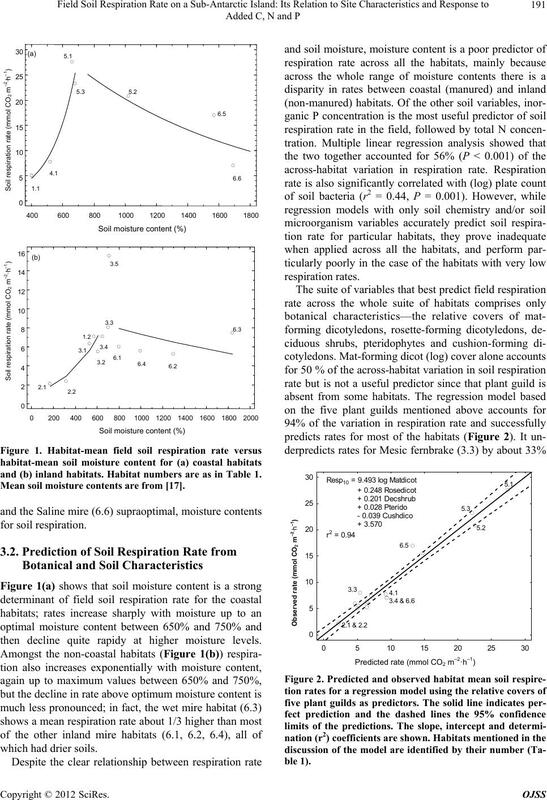 effect on mire soil respiration. NP or G, and the effect was still present after 72 hours. on day 8 (26.5 ± 1.39 mmol CO2 m–2·h–1). 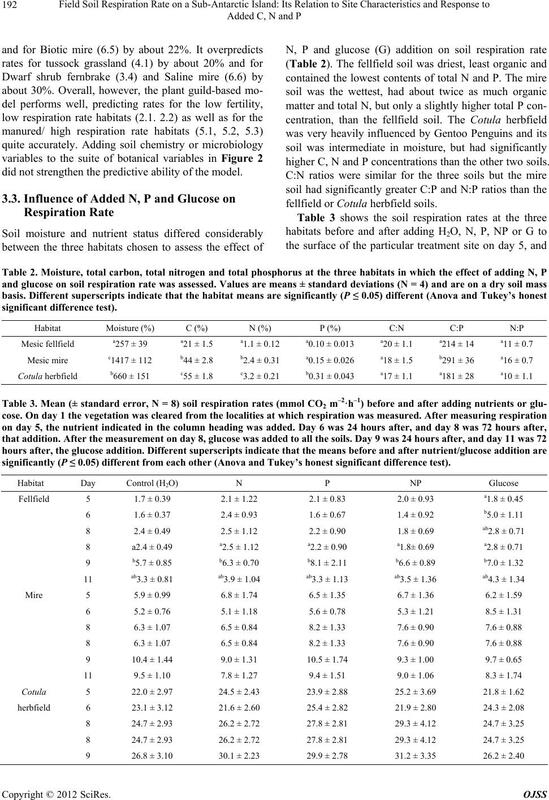 lated soil respiration but adding N, P and NP did not. glucose addition to soil fortified with only N or only P.
glucose of subsamples pretreated with water . stimulation than adding glucose to untreated soil. well for the habitats with low to moderately low rates. and Tourism provided logistical support for this study. Microbial Ecology, Vol. 8, No. 3, 1982, pp. 253-266.
and Biochemistry, Vol. 19, No. 5, 1987, pp. 485-490. Biochemistry, Vol. 25, No. 11, 1993, pp. 1619-1633. 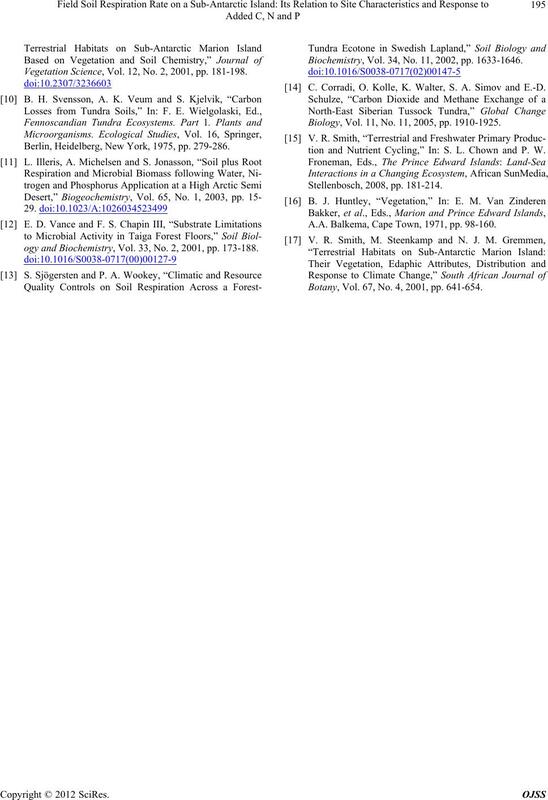 African Journal of Botany, Vol. 58, 1992, pp. 105-116.
try, Vol. 39, No. 2, 2007, pp. 709-713. Vol. 35, No. 1, 2003, pp. 77-91. 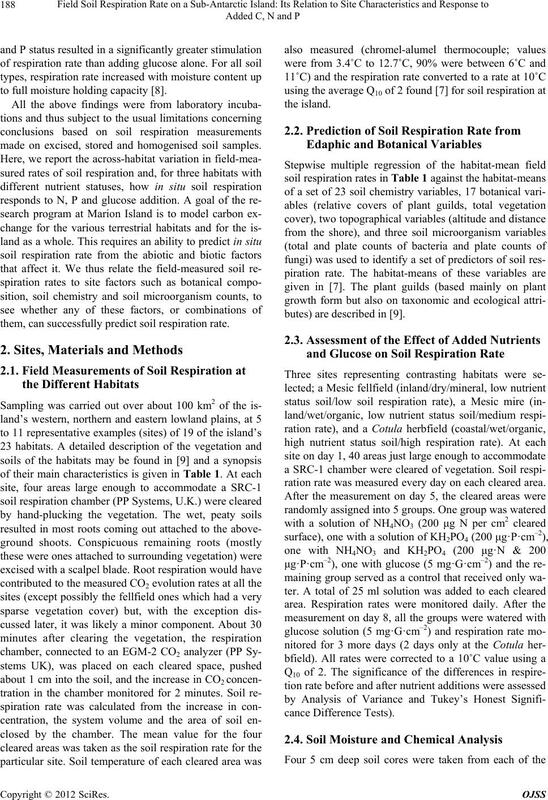 Soil Biology and Biochemistry, Vol. 37, No. 1, 2005, pp. 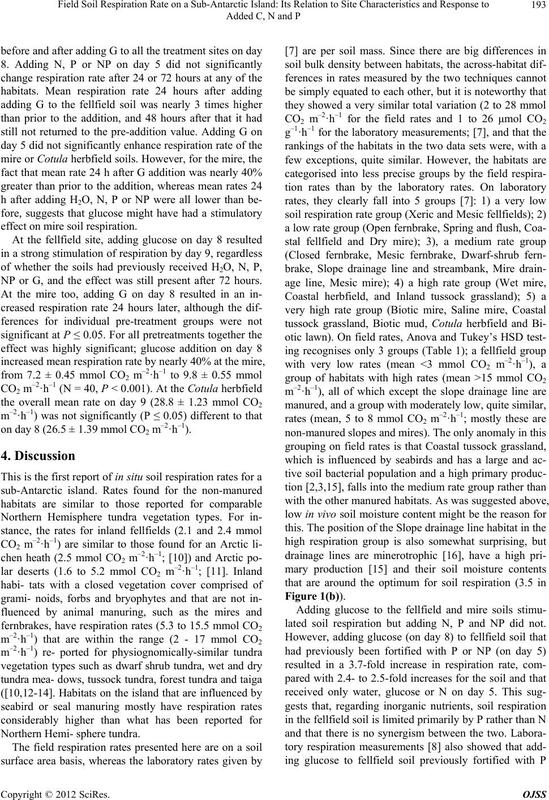 Vegetation Science, Vol. 12, No. 2, 2001, pp. 181-198. Berlin, Heidelberg, New York, 1975, pp. 279-286.
ogy and Biochemistry, Vol. 33, No. 2, 2001, pp. 173-188. Biochemistry, Vol. 34, No. 11, 2002, pp. 1633-1646. C. Corradi, O. Kolle, K. Walter, S. A. Simov and E.-D. Biology, Vol. 11, No. 11, 2005, pp. 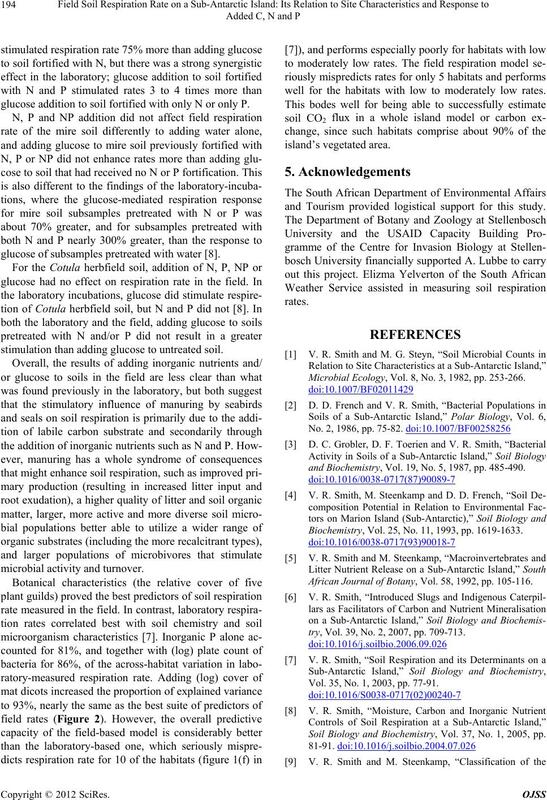 1910-1925.
tion and Nutrient Cycling,” In: S. L. Chown and P. W.
A.A. Balkema, Cape Town, 1971, pp. 98-160. Botany, Vol. 67, No. 4, 2001, pp. 641-654.